A person was killed amid raging fire and explosions caused after a gas tanker got in a traffic accident; massive traffic jams. A man was killed on Wednesday afternoon which caught fire on Highway 1, after an accident in which it hit a car-carrier trailer truck. 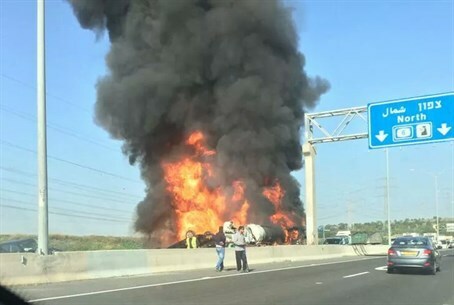 The accident occurred between Ben Shemen Junction and Daniel Junction in central Israel, and several other cars caught fire following the massive blaze emitting from the tanker. The raging fire and explosions from the gas tanker can be seen and heard in the following video, courtesy of Channel 9. The single fatality is apparently the driver of the gas tanker, who was trapped in the cabin after the crash and was killed in the subsequent explosion; large firefighting, police and Magen David Adom (MDA) forces are present at the scene. Massive traffic jams were formed due to the accident, with Highway 1 blocked on the shared section of the road with Highway 6 towards the south at the Ben Shemen Junction. Police are asking the public to avoid the area. MDA paramedic Menahem Klein reported: "It's a truck carrying dangerous materials that caught fire after it apparently was involved in a traffic accident with a truck carrying private vehicles," said MDA paramedic Menahem Klein. "Many MDA teams called to the site are in a security periphery defined by the emergency services and are ready to give medical response to the wounded that are rescued from the scene, and in case the incident develops."